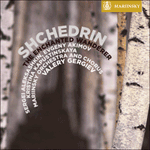 The Enchanted Wanderer was composed by Rodion Konstantinovich Shchedrin in 2002 and its libretto is based on the eponymous story by the nineteenth-century Russian author Nikolai Leskov. It is Shchedrin’s fourth operatic composition and, I believe, the first of its kind: a ‘concert opera’ (unprecedented apparently in the history of modern music, apart from several mono-operas—operas for a solo performer). For many years Shchedrin had mainly worked to commission (as was also the practice in the Baroque period) and The Enchanted Wanderer was no exception. The opera was commissioned by the conductor Lorin Maazel for the New York Philharmonic Orchestra and it was first performed by this orchestra, with Maazel conducting, on 17 December 2002 in New York’s Avery Fisher Hall. The soloists on this occasion were Lilli Paasikivi, Evgeny Akimov and Ain Anger. What better birthday present for Shchedrin, who turned 70 the day before the première? And, of course, Shchedrin dedicated the score to Maazel. When this outstanding conductor commissioned the Russian composer to write the piece, he had in mind ‘something Russian, with ancient chants, the clangour of bells, Polovtsians, Gypsies, and a deep-resounding voice’ (Maazel’s words to Shchedrin). This was the conventional understanding of a ‘Russian’ production and, of course, Maazel had been counting on Shchedrin to bring his originality to the score. The result was a composition of extraordinary freshness, power and depth and yet it still contained all the prerequisite ‘Russian motifs’; only the Polovtsians were missing, but they were replaced by Tatars. On 10 July 2007, Valery Gergiev conducted the first performance in public in Russia, in St Petersburg, with the Mariinsky Theatre orchestra, chorus and soloists. He also conducted Aleksei Stepanyuk’s stage version, which was premièred on 26 July, also in St Petersburg. The audience, as compatriots of the composer and long-standing admirers of his genius, were struck by the very Russian beauty and Russian spirituality of the score. The Leskov story provides much of the sense of ‘Russianness’. Shchedrin said that it had long held a fascination for him. But everything to its own time—and it was only when the composer was approaching 70 that he seemed ready to put this subject matter and text to music. Leskov’s subject matter deals with just about the most important archetypes of Russian life: pilgrimage, selfless love, the fusion of the righteous and the sinful in one personality. When the shadow of devilment (in the shape of Leskov’s Magnetizer) is added to this mix, along with Gypsy verse as the poetry of freedom, the result is a densely-populated picture of Russian life and Russian traits, one that is still relevant to life in Russia today. Leskov’s text is magical in its richness, originality and untranslatability. This untranslatability is illustrated by the very name of the story and the opera, Ocharovannyi strannik. Dahl’s great dictionary of the Russian language has thirteen meanings for the verb ocharovat’ including to enchant, to invocate and to cast gloom. How are we to interpret the word here? All these definitions give useful clues to the meaning. The opera librettist has a very difficult task, for in Leskov’s work the thread of the subject often disappears in the patterned fabric of the words. Shchedrin wrote the librettos for his operas himself (from Dead Souls onwards). He did this consummately, as he did everything in his creative life. But as researchers have pointed out, in this composition he excelled himself. Leskov’s 137-page story, its subject matter and its themes, and even the key verbal tones and colours, have been condensed into an 8-page libretto with aphoristic clarity. The 90-minute opera has a very clear form that is in no way harmed by the oratory and passion (an important role of the choir and narrator) it contains. On the contrary, this is what lends the structure its stability. There are three major dramatic sections and two large parts (7 and 9): here the main tragic subject, from the appearance of Grusha the Gypsy to her death, unfolds and the life history of the Enchanted Wanderer, Ivan Severyanovich Flyagin, is revealed. The third section is the epilogue. Shchedrin constructs the form as not just an open outline but as a closed circle: the final two parts recreate the mood and the semantic motifs of the first parts, with the male chorus of The Lord God has appeared unto us framing the action. The epilogue musically reconciles all the characters and all the subjects; it seems to represent forgiveness. This treatment is reflected in the mood of the audience. In the last stages of the opera Shchedrin achieves a density of sound symbols (male voices singing, bells) equal to the semantic and sound density of the Russian language in Leskov’s tale. But if the music has a deeper impact than the text, even such magical prose as Leskov’s, it is perhaps because music reaches inner emotional depths that the written word cannot. The leitmotifs give the structure cohesion and enhance the content. Few in number, almost all of them speak of the spiritual; for example, the Lord God has appeared motif highlights Salvation, in the case of Ivan and the Monk. Perhaps the most important is the huge impact of the Enchanted Wanderer, his powerful presence built up by choral sounds. As in classical drama, the chorus acts as a commentator. It sets the narrative tone (in all senses of the word) and it is ultimately the choral fragments that focus the opera’s underlying sense of prayer and penitence. Shchedrin particularly sparkles in his mastery of the orchestra and he includes several symphonic episodes, such as the ‘Russian Shepherds’ (with solo woodwind instruments) and the ‘Lament’ postlude (with the entire orchestra). The imaginative use of the orchestral and choral palette for the ‘Tatar Captivity’ is entrancing and continues the oriental tradition in Russian music. After maestro Gergiev had stilled the final chord in the St Petersburg première, there was a long silence in the huge Concert Hall in the Mariinsky Theatre. Then the silence was broken and the audience gave a 30-minute ovation. We had just heard a masterpiece by a major contemporary Russian composer. Our genetic memory, the cultural memory living within us, was stirred. Our collective Russian soul responded to the quiet clanging of bells, for in our spiritual existence the pealing of bells has always signified enlightenment. No one was immune to the farewell calm of the concluding bars of the opera, everyone was affected by the raptness of its choruses. When Grusha the Gypsy sang ‘Could this be my setting sun’, our emotional roots were tapped; dormant symbols came to life, the ingrained, almost genetically implanted, images of women in Russian literature (Grushenka in Dostoevsky’s Brothers Karamazov, Masha in Tolstoy’s The Living Corpse) and all the gypsy associations in Russian culture and Russian tradition. With the Magnetizer (harbinger of Karamazov’s Devil) and the Prince (‘married to money’), the audience was caught up in a veritable circle dance of Russian literature. All this is encased in skilful musical faceting and presented in a composition that is astonishing in its naturalness and artistry. Shchedrin himself had perhaps found a new creative avenue to explore. He had written the choral music based on Leskov’s The Sealed Angel fourteen years before The Enchanted Wanderer, but in the opera the scale is broader and the energy of experience is unmatched. I am convinced that Shchedrin’s skills in choral work (learned at the Moscow Choral College) are a key factor, and his family history (his grandfather was a village priest) would also have been influential. For whatever reason, Shchedrin has continued his pilgrimage deep into spiritual Russia and, inevitably, deep into Russian religious history. The Enchanted Wanderer emerges as the legacy of a whole procession of commissioned instrumental compositions, and is followed by the choral opera Boyarinya Morozova (2006), an obvious and very Russian successor to The Enchanted Wanderer, with Shchedrin once again weaving historical collision into the motifs of Faith. Leskov has once again been brought by Shchedrin to the Russian and world opera stage. The young Shostakovich also drew on his work for inspiration and gave us Lady Macbeth of Mtsensk, with its sometimes cruel eroticism. The Leskov of The Enchanted Wanderer presents goodness and humility. Another Leskov for another composer. ‘Russian’ opera—opera which is dedicated to humanity, morality and Faith—has also been ‘returned’ to the stage. Of course, in The Enchanted Wanderer there is much that is new, starting with the genre itself: there is hardly a single stereotype in it. Shchedrin’s opera is a magnificent, long-awaited coil in the spiralling development of classical music. Young composers may write what they please but the 70-year old master allows us to savour the ‘eternal return’ in Russian music, the eternal return of great Russian culture—just when it is most needed. Le voyageur ensorcelé a été composé par Rodion Konstantinovitch Chtchedrine en 2002, d’après le récit éponyme de l’écrivain russe du XIXe siècle Nikolaï Leskov. C’est le quatrième opéra de Chtchedrine et, je crois, le premier de son espèce: un «opéra pour salle de concert» (catégorie apparemment inconnue dans l’histoire de la musique moderne, en dehors de quelques mono-opéras—des opéras pour un seul interprète). Depuis de nombreuses années, Chtchedrine travaille principalement sur commande (comme cela se pratiquait à l’époque baroque) et Le voyageur ensorcelé ne fait pas exception. Cet opéra a été commandé par le chef d’orchestre Lorin Maazel pour le New York Philharmonic Orchestra, par lequel il a été créé sous la direction de Maazel, le 17 décembre 2002, à l’Avery Fisher Hall de New York, avec pour solistes Lilli Paasikivi, Evgueny Akimov et Ain Anger. On n’aurait pu imaginer plus beau cadeau d’anniversaire pour Chtchedrine, qui avait eu soixante-dix ans la veille de la première. Il va sans dire que Chtchedrine avait dédié sa partition à Maazel. Lorsque ce remarquable chef d’orchestre a demandé au compositeur russe d’écrire cette œuvre, il avait en tête «quelque chose de russe, avec des chants anciens, des sons de cloches, des Polovtses, des Tsiganes et une voix de basse profonde» (comme il l’a dit à Chtchedrine). C’était la conception classique d’une œuvre «russe» à laquelle Maazel comptait bien que Chtchedrine apporterait son originalité. Il en résulta une composition d’une fraîcheur, d’une puissance et d’une profondeur extraordinaires, qui contenait néanmoins tous les ‘motifs russes’ indispensables; il ne manquait que les Polovtses, remplacés par des Tatars. Quand l’opéra fut interprété en public en Russie, à Saint-Pétersbourg, le 10 juillet 2007, Valery Guerguiev dirigeant l’orchestre, le chœur et les solistes du Théâtre Mariinsky, puis quand il fut présenté dans la mise en scène d’Alekseï Stepanyouk le 26 juillet 2008, également à Saint-Pétersbourg, sous la baguette de Guerguiev, les spectateurs, compatriotes du compositeur et admirateurs de son génie depuis longtemps, furent frappés par la beauté et la spiritualité très russes de la partition. L’atmosphère russe de l’œuvre tient beaucoup à l’histoire de Leskov, par laquelle Chtchedrine dit avoir été longtemps attiré. Mais chaque chose en son temps—il fallut qu’il approche les soixante-dix ans pour se sentir prêt à mettre ce sujet et ce texte en musique. Le thème de Leskov traite presque tous les symboles les plus importants de la vie russe: le long voyage, l’amour désintéressé, le mélange de vertu et de péché dans une seule et même personne. Si l’on y ajoute l’ombre du mal (sous la forme du magnétiseur de Leskov), ainsi que des vers tsiganes symboles de la liberté, on obtient une image singulièrement dense de la vie et du caractère russes, qui est encore valable aujourd’hui. Le texte de Leskov est magique dans sa richesse, son originalité et … son aspect intraduisible. Cette impossibilité de le traduire s’illustre dans le titre même du récit et de l’opéra, Ocharovannyi strannik. Le Dahl, le grand dictionnaire de la langue russe, donne treize sens pour le verbe ocharovat’, dont «ensorceler», «invoquer» et «plonger dans les ténèbres». Comment l’interpréter ici? Toutes ces définitions donnent des indications utiles. Le librettiste est confronté à une tâche ardue, car dans l’œuvre de Leskov, le fil du thème disparaît parfois presque dans la trame chamarrée des mots. Chtchedrine a composé lui-même les livrets de ses opéras (depuis Les âmes mortes). Il l’a fait à la perfection, comme tout ce qu’il a réalisé dans sa vie artistique. Mais dans le cas présent, les spécialistes l’ont souligné, il s’est surpassé. Les cent trente-sept pages de l’histoire de Leskov, son sujet, ses thèmes et même les principaux tons et couleurs des mots ont été condensés en un livret de huit pages avec une précision parfaite. Structure et langue L’opéra de quatre-vingt-dix minutes a une forme très claire, absolument pas contrariée par l’oratorio et la passion (rôle capital du chœur et du narrateur) qu’il contient. Au contraire, c’est ce qui confère sa stabilité à la structure. Il comporte deux grandes parties (7 et 9) et trois sections dramatiques majeures, dont la première expose le sujet dramatique principal, de l’apparition de la Tsigane Groucha à sa mort, et révèle l’histoire de la vie du voyageur ensorcelé, Ivan Severyanovitch Flyaguine. La troisième est l’épilogue. Chtchedrine a conçu la forme pas seulement comme un canevas ouvert, mais comme un cercle fermé: les deux dernières parties recréent l’atmosphère et les motifs sémantiques des deux premières, le chœur masculin de «Notre Seigneur nous est apparu» encadrant l’action. L’épilogue réconcilie musicalement tous les personnages et tous les sujets; il semble représenter le pardon et cette approche se reflète sur l’humeur de l’auditoire. Dans les dernières phases de l’opéra, Chtchedrine obtient une densité de symboles sonores (chants masculins, cloches) égale à la densité sémantique et sonore de la langue russe dans le récit de Leskov. Mais si la musique a un impact plus profond que le texte, même pour une prose aussi magique que celle de Leskov, c’est peut-être parce qu’elle atteint des profondeurs émotionnelles auxquelles le mot écrit ne peut parvenir. Les leitmotivs donnent une cohésion à la structure et font ressortir le contenu. Peu nombreux, ils parlent presque tous de spiritualité; par exemple, le motif de «Notre Seigneur nous est apparu» met en avant le salut, dans le cas d’Ivan et du moine. Le plus important est peut-être l’énorme impact du voyageur ensorcelé, dont la présence puissante est établie par le son des choeurs. Le chœur fait office de narrateur—comme dans la tragédie antique, il donne le ton (aux deux sens du terme) du récit, et ce sont en fin de compte dans les parties chorales que se concentre le sens de la prière et de la pénitence sous-jacent dans cet opéra. Chtchedrine est particulièrement brillant dans sa maîtrise de l’orchestre et a inclus plusieurs épisodes symphoniques, comme «Bergers russes» (avec solos d’instruments à vent) et le postlude «Lamentation» (avec l’ensemble de l’orchestre). Son usage imaginatif de la palette orchestrale et chorale pour «Captivité tatare» est enchanteur et poursuit la veine de la tradition orientale dans la musique russe. Après que le maestro Guerguiev eut fait taire les derniers accords de la première de Saint-Pétersbourg, il y eut un long silence dans l’immense salle de concert du théâtre Mariinsky. Puis le silence se rompit et le public fit une ovation de trente minutes. Nous venions d’entendre un chef-d’œuvre—d’un grand compositeur russe contemporain. Notre mémoire génétique, la mémoire culturelle qui vit en chacun de nous, était secouée. Notre âme russe collective réagissait au son calme des cloches, car dans notre vécu spirituel la sonnerie des cloches a toujours évoqué l’illumination. Personne n’était indifférent à l’adieu tranquille des dernières mesures de l’opéra, tout le monde était affecté par l’intensité de ses chœurs. Lorsque la Tsigane Groucha chantait «Pas de crépuscule», notre émoi était à son comble; des symboles en sommeil ressuscitaient: des images enracinées, implantées presque génétiquement, de femmes dans la littérature russe (Grouchenka dans Les frères Karamazov de Dostoïevski, Macha dans Le cadavre vivant de Tolstoï) et toutes les références tsiganes dans la culture et la tradition russes. Avec le magnétiseur (préfiguration du diable de Karamazov) et le prince («marié à l’argent»), l’auditoire était entraîné dans une véritable ronde de littérature russe. Tout ceci enchâssé dans un diamant musical et présenté dans une composition d’un naturel et d’un savoir-faire artistique étonnants. Chtchedrine a sans doute trouvé lui-même une nouvelle voie créative à explorer. Il avait écrit la musique chorale d’une œuvre tirée de L’ange gravé de Leskov quatorze ans avant Le voyageur ensorcelé, mais avec l’opéra il est passé à une dimension plus vaste, d’une énergie incomparable. Je suis convaincu que le talent de Chtchedrine pour l’écriture chorale (qu’il a étudiée à l’Ecole d’art choral de Moscou) est un facteur clé et que son histoire familiale (son grand-père était prêtre dans un village) a également joué. Quelle que soit la raison, Chtchedrine a continué son pèlerinage dans les tréfonds de la Russie spirituelle et, inévitablement, de l’histoire religieuse russe. Le voyageur ensorcelé émerge comme l’héritage de toutes ses commandes de compositions instrumentales et sera suivi par l’opéra choral La Boyarine Morozova (2006), prolongement évident et très russe du Voyageur, dans lequel Chtchedrine mêlera à nouveau collision historique et motifs religieux. Leskov a été une nouvelle fois présenté par Chtchedrine sur les scènes d’opéra russes et internationales. Le jeune Chostakovitch a également puisé dans son oeuvre pour nous donner Lady Macbeth du district de Mtsensk, avec son érotisme parfois cruel. Le Leskov du Voyageur représente la bonté et l’humilité. Un autre Leskov pour un autre compositeur. L’opéra «russe»—un opéra dévoué à l’humanité, à la moralité et à la foi—a lui aussi fait son ‘retour’ sur scène. Il y a évidemment dans Le voyageur ensorcelé beaucoup de nouveauté, il est en soi un genre nouveau, qui ne compte absolument aucun stéréotype. L’opéra de Chtchedrine est une magnifique boucle, très attendue, dans le développement en spirale de la musique classique. Les jeunes compositeurs peuvent écrire ce qu’ils veulent, mais le maître de soixante-dix ans nous permet de savourer «l’éternel retour» dans la musique russe, l’éternel retour de la grande culture russe—juste quand nous en avons le plus besoin. Rodion Konstantinowitsch Schtschedrin schrieb The Enchanted Wanderer im Jahr 2002 zu einem Libretto, das auf der Erzählung Der verzauberte Wanderer des russischen Autors Nikolai Leskow aus dem 19. Jahrhundert beruht. Sie ist Schtschedrins vierte Opernkomposition und meines Wissens ein absolutes Novum, nämlich eine „Konzertoper“ (damals in der Geschichte der modernen Musik unbekannt abgesehen von einigen Mono-Opern, also Opern für einen einzigen Mitwirkenden). Schtschedrin schrieb seit vielen Jahren vorwiegend Auftragsarbeiten (wie es auch im Barock gang und gebe war), und The Enchanted Wanderer bildete keine Ausnahme. Sie wurde vom Dirigenten Lorin Maazel für das New York Philharmonic Orchestra in Auftrag gegeben, das die Oper am 17. Dezember 2002 unter Maazel in der Avery Fisher Hall in New York auch aus der Taufe hob. Die Solisten waren Lilli Paasikivi, Jewgeni Akimow und Ain Anger. Hätte es für Schtschedrin, der am Tag vor der Premiere seinen siebzigsten Geburtstag feierte, wurde, ein schönes Geschenk geben können? Und natürlich hatte er die Partitur Maazel zugeeignet. Als der Dirigent den russischen Komponisten das Werk zu schreiben bat, hatte er „etwas Russisches mit alten Gesängen, Glockengeläut, Polowetzern, Zigeunern und einer volltönenden Stimme“ im Sinn (wie Maazel Schtschedrin erläuterte). Das entsprach den herkömmlichen Erwartungen an eine „russische“ Komposition, und natürlich zählte Maazel darauf, dass Schtschedrin sie mit der ihm eigenen Originalität umsetzte. In der Tat entstand ein Werk von unglaublicher Frische, Kraft und Tiefe, das dennoch alle verlangten „russischen Elemente“ aufweist. Nur die Polowetzer fehlen, sind aber durch Tataren ersetzt. Bei der ersten öffentlichen Aufführung in Russland—am 10. Juli 2007 mit Waleri Gergiew als Dirigent und Orchester, Chor und Solisten des Mariinski-Theaters—und auch bei der Premiere von Alexej Stepanjuks Bühnenversion am 26. Juli ebenfalls in St. Petersburg mit Gergiew am Pult waren die Zuhörer, Landsleute des Komponisten und langjährige Bewunderer seines Genies, beeindruckt von der außerordentlich russischen Schönheit und Spiritualität der Musik. Die Erzählung Leskows enthält bereits viel „Russisches“, und wie Schtschedrin sagte, hatte sie ihn schon seit Jahren beschäftigt. Doch alles hat seine Zeit, und offenbar war der Komponist erst bereit, die Thematik und den Text in Musik umzusetzen, als er auf die Siebzig zuging. Leskows Stoff befasst sich mit den größten Themen des russischen Lebens überhaupt: Wallfahrt, selbstlose Liebe, die Verbindung des Aufrechten und des Sündigen in einer Person. Wird diese Mischung noch um den Schatten des Teuflischen erweitert (in der Gestalt von Leskows Magnetiseur) und um Zigeunerverse als Ausdruck von Freiheit, entsteht ein dichtes Bild des russischen Lebens und der russischen Seele, wie sie noch heute den Alltag in Russland ausmachen. Leskows Erzählung ist bestrickend in ihrer Fülle, ihrer Originalität und Unübersetzbarkeit. Diese Unübersetzbarkeit zeigt sich bereits im Titel der Erzählung und der Oper: Otscharowannji strannik. Dahls großes Wörterbuch der russischen Sprache kennt dreizehn Bedeutungen für das Verb ocharowat’, unter anderem „bezaubern“, „beschwören“ und „einen Schatten werfen, verdüstern“. Wie sollen wir das Wort hier also verstehen? Allerdings vermitteln die vielen Definitionen zumindest eine Ahnung, in welche Richtung unsere Deutung gehen soll. Der Librettist stand vor einer ungemein schwierigen Aufgabe, denn in Leskows Werk verliert sich der Faden der Erzählung häufig im dichten Gewebe der Wörter. Schtschedrin schrieb die Libretti zu seinen Opern selbst (zumindest ab Die toten Seelen), und das mit großem Geschick—wie alles in seinem Leben als Künstler. Doch wie Musikwissenschaftler betonen, übertraf er sich bei diesem Libretto selbst. Es gelang ihm, Leskows 137-seitige Erzählung mit ihrer Thematik und sogar ihren wichtigsten Verbnuancen und -farben in aphoristischer Klarheit auf acht Seiten zusammenzufassen. Struktur und Sprache Die 90-minütige Oper hat einen durchstrukturierten Aufbau, der in keiner Weise beeinträchtigt wird vom Oratorium und der Passion (bei denen Chor und Erzähler eine wesentliche Rolle spielen), die sie enthält. Ganz im Gegenteil, sie erst verleihen dem Aufbau seine Stabilität. Insgesamt gibt es drei umfangreiche dramatische Abschnitte und zwei große Teile (7 und 9): Hier entfaltet sich das Hauptthema—vom Erscheinen der Zigeunerin Gruscha bis zu ihrem Tod—, hier wird die Lebensgeschichte des verzauberten Wanderers Iwan Sewerjanowitsch Flijagin erzählt. Der dritte Teil ist der Epilog. Schtschedrin gestaltet die Form nicht alslockeren Verband, sondern als sich schließenden Kreis: Die zwei abschließenden Teile greifen die Stimmung und die semantischen Motive der ersten Teile wieder auf, wobei der Männerchor mit Gott der Herr ist uns erschienen die Handlung einrahmt. Der Epilog versöhnt musikalisch alle Charaktere und Themen und symbolisiert damit Vergebung. Das schlägt sich auch in der Stimmung des Publikums nieder. Gegen Ende der Oper erreicht Schtschedrin eine Dichte der Klangsymbole (Männerstimmen, Glocken), die der semantischen und klanglichen Dichte des Russischen in Leskows Erzählung nicht nachsteht. Dennoch wirkt die Musik noch tiefgründiger als die Worte—selbst als die magische Prosa Leskows!—, denn gemeinhin spricht Musik emotionale Ebenen an, die das geschriebene Wort nicht erreichen kann. Die Leitmotive, so wenige es sind, verleihen dem Aufbau Zusammenhalt und überhöhen den Inhalt, und praktisch alle verweisen auf die spirituelle Ebene. So betont das Motiv Gott der Herr ist uns erschienen die Erlösung—in diesem Fall für Iwan und den Mönch. Das Wichtigste ist allerdings vielleicht die Wucht des verzauberten Wanderers, dessen mächtige Präsenz durch Choralklänge gestützt wird. Wie im antiken Drama übernimmt der Chor die Aufgabe des Kommentators; er bestimmt den Erzählton (in jeder Hinsicht), und letztlich sind es seine Teile, die die Grundausrichtung der Oper auf Gebet und Buße verdeutlichen. Schtschedrin verblüfft insbesondere durch seinen meisterlichen Umgang mit dem Orchester, und er fügte mehrere sinfonische Episoden ein, etwa die „russischen Hirten“ (mit Solo-Holzbläsern) und das Postludium „Klage“ (mit dem gesamten Orchester). Der einfallsreiche Einsatz der Orchester- und Chorpalette für die „Gefangenschaft der Tataren“ ist hinreißend und bedient die Tradition des Orientalischen in der russischen Musik. Nachdem bei der Uraufführung in St. Petersburg der Schlussakkord verklungen war, herrschte im riesigen Konzertsaal des Mariinski-Theaters eine ganze Weile Stille. Aber dann brandete der Beifall auf, dreißig Minuten fand der Applaus kein Ende. Wir hatten soeben ein Meisterwerk eines der größten zeitgenössischen russischen Komponisten gehört. Unser kollektives Gedächtnis, das kulturelle Gedächtnis, das uns allen innewohnt, war angesprochen worden, unsere kollektive russische Seele nahm das leise Läuten der Glocken auf, denn in unserer spirituellen Kultur verweist Glockengeläut stets auf Erleuchtung. Niemand blieb unberührt von der ausklingenden Ruhe der abschließenden Takte, von der Versunkenheit der Choräle. Als Gruscha die Zigeunerin „Keine Dämmerung“ sang, sprach sie direkt zu unseren emotionalen Wurzeln, verborgene Symbole wurden zu Leben erweckt: die vertrauten, fast genetisch in uns verankerten Frauentypen der russischen Literatur (Gruschenka in Dostojewskis Die Brüder Karamasow, Mascha in Tolstois Der lebende Leichnam) und alle Zigeunerassoziationen der russischen Kultur und Tradition. Mit dem Magnetiseur (dem Vorläufer von Karamasows Teufel) und dem Fürsten („eine Geldheirat“) wurde das Publikum zu einem Stelldichein mit der russischen Literatur gebeten, all das gefasst in gekonnter musikalischer Facettierung und eingebettet in einer Komposition, die durch ihre Natürlichkeit und Kunstfertigkeit besticht. Schtschedrin hatte eine neue kreative Richtung entdeckt, die zu erkunden sich lohnte. Vierzehn Jahre vor The Enchanted Wanderer hatte er Chormusik beruhend auf Leskows Der versiegelte Engel geschrieben, doch in der Oper ist der Horizont weiter, die Energie der Erfahrung ohnegleichen. Ich bin überzeugt, dass Schtschedrins Fähigkeiten in der Chorarbeit (die er an der Moskauer Chorschule erlernte) eine Schlüsselrolle dabei zukommt, von Bedeutung ist sicherlich aber auch seine Herkunft (sein Großvater war ein Dorfpriester). Aus welchen Gründen auch immer, Schtschedrin setzte seine Wallfahrt ins spirituelle Russland und damit zwangsläufig in die russische Religionsgeschichte fort. The Enchanted Wanderer entstand nach einer ganzen Reihe von instrumentalen Auftragskompositionen, darauf folgte die Choroper Bojarin Morosowa (2006), eine nicht überraschende und sehr russische Nachfolgerin des Enchanted Wanderer, in der Schtschedrin wieder historische Wechselfälle mit den Motiven des Glaubens verwebt. Wieder einmal wurde Leskow durch Schtschedrin auf die Opernbühnen Russlands und der Welt gebracht. Auch der junge Schostakowitsch ließ sich von dessen Werk inspirieren und schuf danach seine Lady Macbeth von Mzensk mit ihrer bisweilen etwas grausamen Erotik. Der Leskow des Wanderers vermittelt hingegen Güte und Demut. Ein anderer Leskow für einen anderen Komponisten. Auch die „russische“ Oper – die Oper, die sich der Menschlichkeit, der Moral und dem Glauben verschreibt—erlebt eine Rückkehr auf die Bühne. Natürlich hält The Enchanted Wanderer viel anderes Neuartiges bereit, angefangen mit dem Genre selbst: Es gibt so gut wie kein Stereotyp. Schtschedrins Oper ist eine großartige, lang erwartete Drehung in der Entwicklungsspirale der Musik. Junge Komponisten können schreiben, was ihnen beliebt, aber der 70-jährige Meister gestattet uns, uns an der „ewigen Rückkehr“ in der russischen Musik zu freuen, an der ewigen Rückkehr großer russischer Kultur—in dem Moment, in dem nichts notwendiger ist als eben das. Опера «Очарованный странник» (по Н.С. Лескову) была написана Родионом Константиновичем Щедриным в 2002 году. Это его четвертое оперное сочинение, но ранее ни один подобный опус не назывался «оперой для концертной сцены»: думаю, что перед нами беспрецедентный случай в истории новейшей музыки (исключая некоторые монооперы, то есть оперы для одного действующего лица). Долгие годы Щедрин сочиняет в основном по заказу (возрождая практику эпохи барокко); не стал исключением и «Очарованный странник»: опера была заказана дирижером Лорином Маазелем для Нью-Йоркского филармонического оркестра и впервые представлена этим оркестром под управлением Маазеля (с солистами Лилли Паасикиви, Евгением Акимовым и Айном Ангером) 17 декабря 2002 года в нью-йоркском Эвери Фишер Холл. Никто не смог бы вообразить лучшего подарка к семидесятилетию Щедрина, исполнившемуся за день до премьеры. Разумеется, композитор посвятил свою партитуру Маазелю. Когда этот замечательный дирижер заказывал сочинение русскому мастеру, он и имел в виду «что-то русское. Со старинными песнопениями, колокольным звоном. С половцами. Цыганами. Низкий грудной голос» (слова Маазеля в передаче Щедрина). Все это не более чем ходячие понятия о «русском», и, конечно, Маазель рассчитывал на яркую оригинальность Щедрина-композитора. Но трудно было ожидать, что возникнет сочинение такой свежести, мощи и глубины, как «Очарованный странник», притом – это забавно – при сохранении всех заказанных «русских мотивов» (только «половцев» заменили татары). А когда творение Щедрина впервые показали у нас (Санкт-Петербург, 10 июля 2007 года под управлением Валерия Гергиева с оркестром, хором и солистами Мариинского театра, премьера театральной версии – там же 26 июля 2008 года под управлением Гергиева и в постановке Алексея Степанюка), то и мы, соотечественники композитора и давние ценители его дарования, были поражены русской красотой и русской одухотворенностью его оперной партитуры. Многое объясняется литературной основой оперы, а именно повестью Н.С. Лескова. «Гениальная повесть меня притягивала давно» (Щедрин), но всему свой срок, и, видимо, только на пороге семидесятилетия композитор почувствовал потребность в сюжете и слове Лескова. Сюжет «Очарованного странника» есть отражение едва ли не самых важных архетипов русской жизни: странничества, самозабвенной любовной страсти, слияния праведного и греховного в едином человеческом облике. Если добавить к этому тень дьявольщины (у Лескова – в фигуре Магнетизера) и цыганскую стихию как стихию свободы, то картина русского мира и русского человека окажется необыкновенно полной – и соотносимой не только с 1873 годом, когда была написана повесть, но и с сегодняшним днем в России. А слово Лескова – что ж, это нечто волшебное в своем богатстве, своеобразии и… непереводимости. Начать хотя бы с названия повести (и оперы). В знаменитом Толковом словаре В.И. Даля глагол «очаровать» имеет 13 значений, в том числе «околдовать», «заговорить», «навести мрак». Как истолковать его в нашем случае? Пожалуй, годятся все три приведенных смысла. А перед оперным либреттистом вообще стоит задача необыкновенной трудности, ибо у Лескова сюжетная нить временами почти теряется в узорчатой ткани слов. Щедрин сам писал либретто своих опер (начиная с «Мертвых душ») и делал это мастерски, как всякую работу, за которую он брался. Но можно согласиться с исследователем, что «в этом произведении он превзошел самого себя». 137-страничная повесть Лескова, ее сюжет и темы, а также и ее главные словесные краски переданы в 8-страничном либретто с какой-то афористической ясностью. Полуторачасовой опере Щедрина свойственна такая же ясность формы. Ей, опере, ничуть не вредит присутствие в ней черт оратории и пассиона (важнейшая роль хора и рассказчика). Напротив, из-за этого ее конструкция обретает особую устойчивость: две большие части (девять и семь номеров соответственно) и три крупных драматургических раздела, в первом из которых излагается жизненная история Ивана Северьяновича Флягина («очарованного странника»), во втором разворачивается главный трагический сюжет (от появления цыганки Груши до ее гибели), третий раздел становится эпилогом. Щедрин делает форму сочинения не только рельефной, но и замкнутой: последние два номера воссоздают настроение и смысловые мотивы двух первых номеров (мужской хор «Бо Господь явился нам» обрамляет действие). Считается, что эпилог оперы музыкально примиряет всех ее персонажей и все ее сюжеты, что этот эпилог есть всепрощение. Наши слушательские настроения полностью соответствую такой трактовке. Я бы еще сказал, что Щедрин на последних страницах своего «Очарованного странника» достиг плотности звуковых символов (мужское пение, колокола), равной смысловой и звуковой плотности русского языка в «Очарованном страннике» Лескова. Но если так, то впечатление от музыки сильнее, чем от прозы, даже такой, как лесковская, поскольку музыке доступен глубокий эмоциональный интерьер, невозможный для письменной речи. Ценнейший содержательный план оперы – лейтмотивы; их немного, и почти все они относятся к ее духовной стороне (упомянутый мотив «Бо Господи…», мотив Спасения души у Ивана и Монаха). Но едва ли не важнее лейтмотивов такая огромная созидающая реальность «Очарованного странника», как звучание хора. Хор выполняет функции комментатора – по примеру античной драмы, он задает повествованию тон (в любом смысле слова) и, в конце концов, хоровые фрагменты оперы есть средоточие ее молитвенного смысла и в особенности ее покаянной молитвы. Разумеется, Щедрин не был бы самим собой, если не блеснул бы оркестровым мастерством в своей опере и не развернул бы в ней нескольких симфонических эпизодов. Среди них выделю интерлюдию «Российские пастухи» (с солирующими деревянными духовыми) и постлюдию «Плачи» (с участием всего оркестра); захватывает оркестрово-хоровая картина «Татарский плен», продолжающая великую ориентальную традицию нашей музыки. Почему долгая тишина установилась в огромном Концертном зале Мариинского театра после того, как маэстро Гергиев снял последнее созвучие на премьерном исполнении «Очарованного странника» в Петербурге? Почему она взорвалась получасовой овацией? Мы услышали шедевр крупнейшего композитора сегодняшней России. В движение пришли наши генетическая память и «память культуры», живущая в нас. Никто из россиян не может не отозваться на тихий колокольный звон, ибо в нашем духовном бытии он всегда присутствовал как знак просветления. Никто не может не проникнуться прощальным покоем заключительных тактов оперы или сосредоточенностью ее хоров. А когда цыганка Груша запевает: «Не вечерняя заря», – то наше волнение необычайно, потому что даже и не «вспоминаются», а генетически оживают в нас женские образы Достоевского (Грушенька из «Братьев Карамазовых»), Толстого (Маша из «Живого трупа») и все цыганское в русской культуре и русском предании. А тут еще и Магнетизер (предвестник карамазовского Черта), еще и Князь, «женившийся на деньгах» …словом, вас обступает хоровод русской литературы – и все это в искуснейшей музыкальной огранке, в композиторском воплощении, удивительном по естественности и артистизму. Для самого Щедрина, как я думаю, открылся новый творческий горизонт. Хотя за четырнадцать лет до «Очарованного странника» композитор уже написал хоровую музыку по «Запечатленному ангелу» Лескова, но в опере масштаб шире и сила переживания беспрецедентна. Уверен, что вновь сказалась хоровая выучка Щедрина (в Московском хоровом училище); не могла о себе не напомнить также и его родословная (дед был сельским священником). В любом случае продолжился его путь вглубь духовной России и – неизбежно – вглубь русской духовной истории. На фоне целой вереницы заказных инструментальных сочинений возникает «Очарованный странник», а позже появляется русская хоровая опера «Боярыня Морозова» (2006) - явная преемница «Странника», поскольку Щедрин здесь вновь замешал историческую коллизию на мотивах Веры. Хочу также сказать, что со Щедриным в русскую и мировую оперную музыку снова пришел Лесков. Не тот Лесков, которого некогда с жестокой эротичностью молодого гения дал Дмитрий Шостакович в опере «Леди Макбет Мценского уезда», а Лесков, исполненный добра и смирения. Другой Лесков вернулся с другим композитором. Вернулась и русская опера – та опера, которая посвящала себя гуманности, морали и Вере. Конечно, в «Очарованном страннике» много нового (начиная с жанра), да и вообще в нем не найти ни одного стереотипного решения. Но в целом опера Щедрина – это великолепный взлет классической музыкальной традиции, долгожданный разворот ее спирали. Пусть молодые авторы пишут, как им нравится, а семидесятилетний мастер позволил нам насладиться благоуханием «вечного возвращения» в русской музыке, вечного возвращения высокой русской культуры – именно тогда, когда мы больше всего нуждаемся в таком возвращении. Ivan Severyanovich Flyagin, a novice at Valaam Monastery, is reminiscing about his life. In his youth he had once flogged a monk ‘for a laugh’ and accidentally killed him. Later the monk appears to him in a vision, reproaching Ivan for depriving him of his life without giving him a chance to repent. He says that Ivan is God’s ‘promised’ son and gives him a sign that though he will die many times, he will never properly depart this life until real death comes to him, and he will end up in the monastery on Valaam Island in fulfilment of his mother’s promise. Although Ivan does not believe the monk’s prophecy, it does indeed come true. During his wanderings, Ivan is taken captive by Tatars and lives with them in the Ryn-peski desert for ten years. Escaping at last from the Tatars, he meets some shepherds on his way back to his native land and enters the service of a prince who values his skill with horses. However after three years of diligent service Ivan starts drinking heavily. In one inn, he becomes friendly with the landlord who has the gift of hypnosis. That same night, in another hostelry, Ivan spends all the money entrusted to him by the prince on a beautiful young Gypsy singer, Grusha. When the prince asks Ivan for the five thousand roubles he had entrusted to him, Ivan confesses and tells him about the beautiful Gypsy girl. Then the prince, falling in love with her himself, gives the Gypsy camp a huge dowry of fifty thousand gold roubles and takes her off home with him. But the prince is a fickle man and he soon tires of Grusha. On a trip to town Ivan learns that his master is planning to marry a rich noblewoman but, on returning home, he is unable to find the Gypsy girl: the prince has secretly taken her off into the swamps of the forest. However Grusha escapes, meets up with Ivan and forces him to swear a terrible oath, begging him to kill her as otherwise she herself will kill the faithless prince and his young bride. To carry out her plea, Ivan throws Grusha from a cliff top into the river below. In visions Ivan hears the voices of those he has killed: the monk and the Gypsy girl Grusha. Ivan Severyanovitch Flyaguine, novice au monastère de Valaam, évoque ses souvenirs. Pendant sa jeunesse il a fouetté un moine «histoire de rire», le tuant accidentellement. Ce moine lui apparaît ensuite en lui reprochant de lui avoir pris la vie sans lui avoir donné la moindre possibilité de se repentir. Il dit qu’Ivan est le fils «promis» de Dieu et lui fait comprendre que, même s’il mourra de nombreuses fois, il ne quittera jamais complètement ce monde tant que la vraie mort ne le frappera pas et qu’il finira dans le monastère de l’île Valaam pour accomplir la promesse de sa mère. Bien qu’Ivan ne croie pas la prophétie du moine, celle-ci se réalise. Au cours de ses voyages, Ivan est fait prisonnier par des Tatars et vit avec eux dans le désert de Rynpeski pendant dix ans. Leur échappant enfin, il retourne vers son pays natal quand il rencontre quelques bergers et entre au service d’un prince qui apprécie son adresse avec les chevaux. Néanmoins après trois ans de bons et loyaux services, Ivan se met à boire abondamment. Dans une auberge, il devient l’ami du patron qui a des dons d’hypnotiseur. Le même soir, dans une autre taverne, il dépense tout l’argent que le prince lui avait confié pour une jeune et belle chanteuse tsigane, Groucha. Lorsque le prince lui réclame ses cinq mille roubles, Ivan avoue et lui parle de la belle Tsigane. Puis le prince, tombant lui-même amoureux d’elle, donne au campement tsigane une énorme dot de cinquante mille roubles en pièces d’or et amène Groucha chez lui. Mais c’est un inconstant, qui se lasse vite d’elle. En route pour la ville, Ivan apprend que son maître projette d’épouser une riche femme noble, mais de retour chez lui il ne retrouve pas la jeune Tsigane: le prince l’a secrètement emmenée dans les marais des bois. Groucha réussit à s’échapper, rencontre Ivan et le force à faire un terrible serment, le suppliant de la tuer, sans quoi elle tuera de ses propres mains le perfide prince et sa jeune fiancée. Pour exécuter sa promesse, Ivan jette Groucha dans la rivière du haut d’une falaise. Et dans ses visions, il entend pour l’éternité la voix de ceux qu’il a tués, le moine et la Tsigane Groucha. Iwan Sewerjanowitsch Fljagin, ein Novize im Kloster Walaam, blickt auf sein Leben zurück. In seiner Jugend hat er einmal „aus Spaß“ einen Mönch verprügelt und ihn dabei aus Versehen getötet. Später sucht ihn der Mönch in einer Vision auf, wirft ihm vor, ihn um sein Leben gebracht zu haben, ohne ihm die Möglichkeit zur Buße zu geben. Er sagt, Iwan sei Gottes „verheißener“ Sohn, und gibt ihm ein Zeichen, dass er zwar viele Tode sterben wird, aber dieses Leben nie richtig hinter sich lassen wird, bis der richtige Tod ihn ereilt, und dass er, in Erfüllung des Versprechens seiner Mutter, im Kloster auf der Insel Walaam enden wird. Iwan glaubt zwar nicht an die Prophezeiungen des Mönchs, doch sie erfüllen sich tatsächlich. Auf seiner Wanderschaft wird Iwan von Tataren gefangen genommen und verbringt zehn Jahre bei ihnen in der Ryn-Wüste, ehe ihm schließlich die Flucht gelingt. Auf dem Rückweg in seine Heimat begegnet er einigen Schäfern und tritt in den Dienst eines Prinzen, der von seinem Geschick im Umgang mit Pferden beeindruckt ist. Nach drei Jahren zuverlässiger Arbeit fängt Iwan jedoch stark zu trinken an. In einem Gasthof befreundet er sich mit dem Wirt, der die Gabe der Hypnose besitzt. Am selben Abend gibt Iwan in einem anderen Wirtshaus das ganze Geld, das der Prinz ihm anvertraut hat, für die schöne junge Zigeunersängerin Gruscha aus. Als der Prinz Iwan nach den ihm anvertrauten fünftausend Rubel fragt, gesteht Iwan, was er getan hat, und erzählt ihm von der schönen Zigeunerin. Der Prinz verliebt sich selbst in sie und gibt dem Zigeunerlager die immense Mitgift von fünfzigtausend Goldrubel, um Gruscha zu sich nach Hause zu holen. Doch unstet, wie er ist, wird er des jungen Mädchens bald überdrüssig. Auf einer Fahrt in die Stadt erfährt Iwan, dass sein Herr eine reiche Adelige heiraten will, und als er nach Hause zurückkehrt, kann er das Zigeunermädchen nicht finden—der Prinz hat sie heimlich ins Moor mitten im Wald gebracht. Doch Gruscha entkommt ihm, trifft mit Iwan zusammen und nimmt ihm einen grausigen Schwur ab: Sie fleht ihn an, sie zu töten, da sie sonst den treulosen Prinzen und seine junge Braut ermorden werde. Um ihre Bitte zu erfüllen, stößt Iwan sie von den hohen Klippen in den Fluss. In Visionen hört er dann die Stimmen derer, die er getötet hat: den Mönch und das Zigeunermädchen Gruscha. Иван Северьянович Флягин, послушник Валаамского монастыря, вспоминает о своей жизни. В отрочестве он однажды «смеха ради» ударом кнута нечаянно убил монаха. Монах явился ему в видении, укоряя за то, что Иван лишил его жизни без покаяния. Он же рассказал Ивану Северьяновичу, что тот – «обещанный» Богу сын, и дал «знамение», что будет он много раз погибать и ни разу не погибнет, пока не придёт ему настоящая «погибель», и пойдет он во исполнение материнского «обещания» в монастырь на Валаам остров. Хоть и не поверил Иван Северьянович, а сбылось пророчество монаха. Странствуя, попал Иван в плен к татарам и прожил с ними в самых Рынь-песках десять лет. Бежал от татар, повстречал пастухов на пути из плена, а возвратившись в родные места, поступил на службу к князю, который оценил его умение хорошо разбираться в лошадях. Однако после трёх лет усердной службы Ивана Северьяновича начали одолевать запои. В одном из трактиров Флягин познакомился со спившимся барином, обладавшим даром гипноза. В ту же ночь в другом трактире Иван Северьянович растратил все деньги, оставленные ему князем, на прекрасную певунью цыганку Грушеньку. Когда князь потребовал от Ивана Северьяновича пять тысяч рублей, что были доверены ему, Флягин, повинившись, рассказал о прекрасной цыганке. Влюбившись в Грушу, князь отдал табору огромный выкуп в полсотни тысяч рублей золотом и забрал её к себе в дом. Но князь – человек переменчивый, и Груша ему быстро наскучила. Во время поездки в город Иван Северьянович узнал, что его хозяин собирается жениться на богатой дворянке, а вернувшись домой, он не застал цыганку: князь тайно отвёз её в лес на болото. Однако Груша сбежала из заточения, встретилась с Флягиным и, взяв с него страшную клятву, просила убить её, поскольку иначе она сама убьёт неверного князя и его молодую невесту. Иван Северьянович, исполняя Грушину просьбу, скинул её с крутизны в реку. В видениях Флягин слышит голоса убиенных им монаха и цыганки Груши. Чертог твой вижду, Спасе мой. Иван Северьянович: Я родился в крепостном звании в Орле. Chorus: God is the Lord, and hath revealed Himself unto us. I behold thy chamber, my Saviour. I behold thy chamber adorned. Ivan Severyanovich: I was born in serfdom in Orel. Монах: Иван, пойдем, брат, Иван! Иван Северьянович: Ты кто? Зачем зовешь меня? Монах: Ты засек меня до смерти. Без покаяния. Monk: Ivan, let’s go, brother, Ivan! Ivan Severyanovich: Who are you? Why are you calling me? Monk: You flogged me to death. Without final absolution. Иван Северьянович: Азията в веру приводить пошел! Рассказчица: Азиятам о вере очень понравилось. Хор: Где, идучи к нам, деньги свои закопал?! Где деньги, где деньги, где деньги? Иван Северьянович: Нет денег, нет, нет. Бог без всего послал, с одной мудростью. Хор: А где деньги, где деньги, где деньги? Ivan Severyanovich: Went to convert the Asians! Storyteller (Female): The Asians liked hearing about faith. Chorus: Where did you bury your money when you came to us?! Where’s the money, where’s the money, where’s the money? Ivan Severyanovich: There is no money, no, no. God sent me with nothing but wisdom. Chorus: Ah, where’s the money, where’s the money? Иван Северьянович: да укрепиши и благая творити. Иван Северьянович: Умоли Господа Бога избавити мя от мытарств. Лебедики мое, помогите, помогите, помо … А! Иван Северьянович: Был от плена чудом спасен. Ivan Severyanovich: and fortify me that I might do good. my little swans, help me, help … Ah! Ivan Severyanovich: I was saved from captivity by a miracle. Иван Северьянович: Я в лошадях понимал. Очень. С детства. раз дар к коню имеешь. Иван Северьянович: Жил отлично я три года. Но запои одолели. Водка губила. and hath revealed Himself unto us. Ivan Severyanovich: I understood horses. Well. From childhood. since you have the gift for horses. Ivan Severyanovich: I lived very well for three years. The prince trusted me. And with money, too. Иван Северьянович: Уехал как-то князь по делам. А сумма при мне знатная. Более как до пяти тысяч. Нет! Не стану больше пить! Магнетизер: Эй, ты это чай пьешь? Иван Северьянович: Да. Хочешь и ты со мной пей. Магнетизер: Я чая пить не могу. Вели мне графин водки лучше подать сюда! Иван Северьянович: Ты кто такой? Иван Северьянович: Может ты черт? Иван Северьянович: А ты брось пить! Я без водки в кровать не попаду. Магнетизер: А ты разве пьешь? Иван Северьянович: Пью. И временами даже очень усердно пью. Иван Северьянович: Я пить не стану! Пей, пей, пей, пей, пей! Магнетизер: Пей, пей, пей, пей, пей, пей! Иван Северьянович: Нет, нет, нет, нет, нет! Иван Северьянович: Как ее я постигну? Магнетизер: А вот пойдем: увидишь! пошли, пошли, пошли, пошли, пошли! Ivan Severyanovich: Once the prince left on business. And I had a magnificent sum. No! I won’t drink anymore! Magnetizer: Hey! What, are you drinking tea? Ivan Severyanovich: Yes. Drink with me, if you like. Magnetizer: I can’t drink tea. Ivan Severyanovich: Why is that? I have a head for trouble. Have them bring me a carafe of vodka! Ivan Severyanovich: Who are you? Ivan Severyanovich: Could you be the devil? I am your eternal friend. As long as I can be drunk and forget myself! Ivan Severyanovich: You should stop drinking! I won’t get into bed without vodka. Ivan Severyanovich: It’s a sin. Ivan Severyanovich: I do. And sometimes very hard. Ivan Severyanovich: I won’t drink! Magnetizer: I’m your healer now. Magnetizer: Drink, drink, drink, drink, drink, drink! Ivan Severyanovich: No, no, no, no, no! Magnetizer: Drink drink, drink, drink, drink, drink! Magnetizer: Woman is the perfection of beauty. Ivan Severyanovich: How will I master it? Magnetizer: Let’s go now: you’ll see! let’s go, let’s go, let’s go, let’s go! (к Ивану) Выкушай, гость дорогой, про мое здоровье. и деньги на поднос сыплет. Она его тогда в уста поцелует. Иван Северьянович: Эх вы, волк вас съешь! а сей невиданной красы я скупостью не унижу! Эй! Пущу свою душу вволю погулять! Зачем тебя, красавица, небо сделало? Сторонись, народ, а то оболью! да сразу все их Груше под ноги бросил! много страсти в крови у меня разлито. Хор: Эх, да тари, тари, тари … Яй, Яй! Груша: Эх, да тари, тари, тари … Яй, Яй! he drinks the wine and drops coins on the tray. and bow to his feet. Ivan Severyanovich: Hey, may you all be eaten by wolves! I’ll pay back the prince in service! this unequaled beauty with stinginess! Hey, I’ll carouse to my heart’s content! Why did heaven create you, my beauty? Stand back, people, or I’ll spill on you! If you fall in love with me I won’t ask you why. There’s a lot of passion in my blood. Chorus: Eh, tari, tari, tari … yaiee, yaiee! Grusha: Eh, tari, tari, tari … yaiee, yaiee! Иван Северьянович: У меня без вас большой «выход» был. Князь: Куда ж ты мог за раз пять тыщ деть? Иван Северьянович: Я их цыганке враз и бросил. Иван Северьянович: Спасе мой … Я вешаться вздумал. Ох! Попал я в лазарет надолго. за пятьдесят тысяч золотом и увез ее к себе в дом. Иван Северьянович: Сказал: надо мне вам деньги отслужить. Князь: (указывая на Грушу) Что, хороша? За нее и смерть принять можно. Prince: Where is the money? Ivan Severyanovich: While you were gone, I had a large 'expense'. Prince: Where can you spend five thousand in one go? Ivan Severyanovich: I gave it to a gypsy woman. Ivan Severyanovich: My Saviour …I tried to hang myself. Oh! They pulled me out of the noose. for fifty thousand in gold and brought her to his house. Prince: What do you want? Ivan Severyanovich: I said: I have to serve you to repay the debt. Prince: (pointing at Grusha) Isn’t she a beauty? Ivan Severyanovich: A beauty, I replied. One could gladly die for her. Иван Северьянович: Князь был добрый человек. Ах, нет ли где моей разлучницы? Уж не к свадьбе ль то?.. Ivan Severyanovich: The prince was a kind man. Soon he tired of Grusha. Ah, is there a rival out there? Is there a wedding coming? Иван Северьянович: Порешил и вправду князь жениться. Бом, Бом, Бом … А! Иван Северьянович: Услал и меня из города князь. Может, князь ее и прикончил? Погубил ее, злодей? Ножом ли пистолетом? Она ему помеха была, чтоб жениться. Любила его Груша своей страстной цыганской любовью. Поищу ее. Не попаду ли где я на ее тело убитое?! Где ты Груша, Грунюшка, где ты? Покажись мне: жива ль ты? Ivan Severyanovich: The prince really did decide to marry. Bom, Bom, Bom … Ah! Ivan Severyanovich: The prince sent me out of the city. The house where Grusha lived was razed. What if the prince got rid of her? Killed her, the villain? With a knife, a pistol? She was an obstacle to his marriage. Grusha loved him with her passionate gypsy love. I’ll search for her. Maybe I’ll find her dead body? Where are you, Grusha, Grunushka, where are you? Show yourself: are you alive? Груша: Я жива. Только я сюда умереть вырвалась. Старичок в лесу мне встретился. Ему сказала: видеть тебя хочу. Он затоскует и придет тебя искать. Иван Северьянович: (про себя) То мой мертвый монах был. Груша: Ты мне все равно, что милый брат. Иван Северьянович: А ты мне равно, что сестра милая. Груша: Один ты и любил меня, мил сердешный друг. Груша: Докажи теперь мне ты свою любовь. Сделай, что я попрошу тебя. Иван Северьянович: Говори, что тебе хочется. Иван Северьянович: Спасением души клянусь! Груша: Пожалей меня, родной мой, мой миленький брат. Стань душе моей за Спасителя. Иван Северьянович: Что ты, Грунюшка? Груша: Сил нет так мучиться, видучи его измену. Не погуби же меня, чтобы я на себя руки подняла! Иван Северьянович: Что ты? Что ты? Да что ты? Что ты, родная?! и его жену младую кончу, кончу! Груша: Пожалей, пожалей меня, родной мой брат! Ударь меня раз ножом против сердца! стану я в отместку самой стыдной женщиной! Иван Северьянович: Нож достала. В руки мне сует. Груша: Пожалей, пожалей меня, брат мой! Иван Северьянович: Молись, молись, молись! Груша:, ИВАН и Хор: А! Иван Северьянович: Да и скинул я Грушу с крутизны в реку! Хор: Покаяния отверзи ми двери, Жизнедавче. Помилуй мя, Боже, помилуй, Жизнедавче. Grusha: I’m alive. But I escaped to come die here. I met an old man in the forest. I told him: I want to see you. He’ll miss you and come looking for you. Grusha: And so we meet. Ivan Severyanovich: (to himself) That was my dead monk. Grusha: You are like a dear brother to me. Ivan Severyanovich: And you are like a sweet sister to me. Grusha: Only you loved me, my heart’s dear friend. I bored him, grew cold. Do what I ask of you. Ivan Severyanovich: Tell me what you want. Ivan Severyanovich: On the salvation of my soul, I swear! Grusha: Pity me, my dear one, my sweet brother. Ivan Severyanovich: What do you mean, Grunushka? Grusha: I don’t have the strength to go on suffering, seeing his betrayal. Don’t condemn me to killing myself! Ivan Severyanovich: What are you saying? What do you mean, Grunushka? What are you saying, dear one? and kill his young bride! why, why must you die?! Grusha: Pity me, pity me, my own brother! Strike me with the knife once in the heart! Ivan Severyanovich: For God’s sake, Grunushka! I’ll take revenge as the most shamed woman! Ivan Severyanovich: She took out a knife. Shoved it in my hands. I can live no longer! Grusha: Pity, pity me, my brother! Ivan Severyanovich: Pray, pray, pray! Grusha:, IVAN and Chorus: A! Ivan Severyanovich: And I pushed Grusha from the dizzying cliff into the river! Chorus: Open to me the doors of repentance, Life-giver. Have mercy upon me, God, Have mercy on me, Life-giver. Монах: Иван, иди брат, Иван, Иван. Monk: Ivan, come, brother, Ivan, Ivan! Ivan Severyanovich: … To pray to God.